Australian Quakers participated in the COP22 Interfaith Climate Statement below and we invite you read and to add your name to the Statement. We all desire for a safer future, free from climate change. Confronting this crisis is the great moral imperative of our time. It requires urgent, transformative action to slow (and hopefully reverse) the acceleration of global warming that is now underway. People of faith and goodwill have an important role to play in showing the way forward on this moral imperative. Faiths also play an important role in as we grieve our losses and practice hope. Together, we can make a difference! adding your name to the COP22 Interfaith Climate Statement that will be presented to the international climate change talks in Marrakech in November. spreading the word about the Statement and asking others to sign it. Your name will be shown on the Statement website and the total number will be mentioned in the official handover event on 10 November 2016 at COP22, along with high-level religious and spiritual leaders and recognised faith-based environmental leaders who are signing under the official Statement. At this historic moment, as the Paris Agreement enters into force, an unprecedented global consensus has produced a universal framework to reduce greenhouse gas emissions, and to build greater resilience to climate impacts. We are profoundly grateful for the leadership that produced this agreement. We are also mindful of the challenges and complexity that lie ahead. 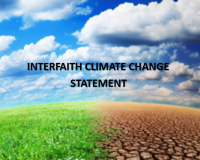 The COP22 Interfaith Climate Statement also emphasises that, across all faiths we share a moral obligation to not harm others, to be fair and to care for the vulnerable. The drafting and dissemination of the Statement and the related handover event is a joint collaboration with representatives from more than 30 faith-based organisations from across the world, including ARRCC. Ask, including within our own faith communities, for more commitments to divest -invest from fossil fuels into renewable energy and targeted engagement with companies on climate change. We need to ground this work in pursuing a just transition to renewable energy. Please join faith leaders & all people of goodwill to join the call for urgent action on climate change by signing the Statement. Please help spread the word through your networks and on social media. For guidance on the Twitter thunderclap scheduled for November 4th and Facebook ideas, see here. Together we can light the way!